Barefoot's kitchen, dining and living area on the middle level features polished floor boards, a comfy leather lounge suite with TV and DVD. The balcony off the front is large enough for alfresco dining. The balcony off the back catches the morning sun and looks over the downstairs courtyard and garden. This rental accommodation is tastefully furnished and freshly decorated with a great collection of original and poster artwork throughout. With two separate living areas on the lower and middle levels, there is plenty of room for the adults to relax on the middle level and the children to enjoy their own space downstairs where there is a 2nd TV and a third bathroom. The upper level is all carpeted and features 3 spacious bedrooms, a main bathroom and an en-suite off the master bedroom with a corner spa. Just a stroll across the road is the patrolled Fingal Bay Beach, Longboat Cafe, Saltwater Restaurant upstairs in the Fingal Beach Surf Club, children's playground, and a cycle and walking path along the promenade. 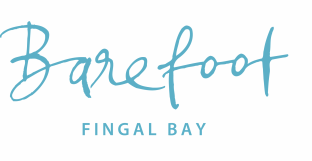 It's only 10 minutes walk to Market Street in Fingal Bay. Here there is a hairdresser, a café/winebar and a couple of shops where you can pick up daily newspapers and basic food items.